CATHOLIC pilgrims marked one of their most important days in their faith journey when they travelled for Pope Francis’ visit to the south of Ireland. It was the first Papal visit since Pope John Paul II visited 39 years ago. While Pope Francis made a visit to the Knock Shrine in Co Mayo, the rest of his visit was based in Dublin over the weekend. More than 200 parishioners in five coaches left St Patrick’s Church in Downpatrick at 7am on Sunday to attend the Papal mass in Phoenix Park. 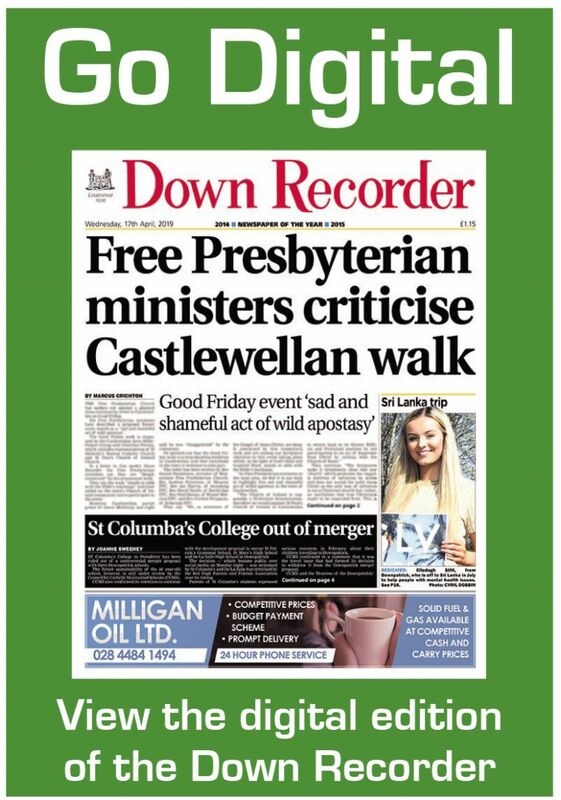 Fr John Murray, parish priest of Downpatrick, who has responsibility for all 10 parishes in the Downpatrick and Lecale parish community, reported that demand for the mass was still strong late on Saturday night. “When we first decided to organise a coach to Dublin, we didn’t know if we could fill one, then we filled another one, and then another, and another. Such was the demand that people were even contacting me on Saturday night to see if we had any spare tickets,” he said. Local priests who attended the mass were Fr Gerry McCloskey from Ardglass and Fr Brian Brown of St Patrick’s in Ballynahinch. Despite the visit being viewed a difficult one as Pope Francis was being called upon to address the many instances of institutional abuse and clerical sexual abuse of children and women in the island’s recent history, parishioners were still excited to see and eager to listen to the words of their spiritual leader. Downpatrick man Jackie Breen, who attends St Patrick’s Church, says that the experience of seeing his spiritual leader will stay with him for a lifetime. He made sure to make the visit special for his family by personally attending the earlier Festival of Families events on Thursday and Friday, attending the Croke Park concert with his wife Tracey and daughter Lucy and then the Phoenix Park mass on Sunday with his son Dylan. “Pope John Paul gave us the blessing of peace in Ireland when he spoke here and that was also seen in Europe a few years later and I believe that Pope Francis has left us with the special blessing of hope and healing in his visit,” said Mr Breen. He added that the entire Festival of Families and the Pope’s words helped to underline how crucial the role that families have in global society. McCartan Digney (23), says that he felt very emotional about the entire experience. He travelled with his mother Louise to Phoenix Park and proudly carried the yellow and white Papal flag that she had when she went to see Pope John Paul at the youth Mass in Galway. “Ever since I watched a TV documentary about nine years on the 30th anniversary of Pope John Paul’s visit, I’ve wanted to see our Holy Father myself and kept the flag for my chance and I couldn’t believe that I got the chance to do so,” he said. For Mark Ferris from Drumaness and his partner Kathleen Oliver, their attendance in Dublin during the entire Papal visit was the highlight of a very religious week. Earlier in the week while holidaying in Portugal, the couple visited the Sanctuary of Our Lady of Fatima. Mr Ferris was a boy of eight when he last saw a serving pope in Ireland when Pope John Paul II visited in 1979. However, he watched the mass at Drogheda, estimated to have nearly attracted 1.3m people, on the television at home with his family. For this visit, Mr Ferris says he was determined not to miss out. “My partner had arranged for us to go to Dublin for the Pope’s visit as a birthday celebration but I would have been there no matter what. “This experience was something that I would never will forget and well worth the blisters I have on my feet in walking the five or six miles to Phoenix Park. “When the Pope did his tour of Dublin, we were really close when he pass by and I believe he looked directly at me. South Down MLA Colin McGrath also attended Sunday’s Papal Mass. While he represented the SDLP along with deputy Nicola Mallon, he travelled down as part of the Downpatrick and Lecale parish group. He said that the event was notable for the number of young people who attended. “The atmosphere was electric and it was a special moment when the Pope arrived. He added: “Pope Francis also sent a special message of forgiveness and healing for the Church’s involvement in difficult matters in the past which was important too.